The following document contains two suggestions for team activities for the Japan 2001 Workshop. 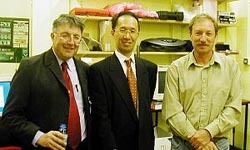 Eric Albone requested the suggestions at the conclusion of his visit to Cleveland, Ohio, on April 12, 2001. He then shared the suggestions with his colleagues at Bristol University for a decision on their inclusion in the Workshop. The first suggestion was the basis of the Space Science Team activity. Objective: Draw conclusions on the structure, history, and origin of the Martian volcanoes in Tarsus by comparing NASA photographs of the Martian volcanoes with terrestrial volcanoes. · Making a final presentation. If opposing theories arise, the theories should each be developed and presented with supporting strengths and weaknesses. The students will thus get a taste of comparative planetology as practiced by NASA scientists in collaboration with professionals from different walks of life. Objective: Using terrestrial analogs (e.g., thunderstorms), develop a research program for a future robotic flyer to Mars to study electrical phenomena in depth. · Martian surface dust acquires an electrical charge by friction (e.g., compaction by an astronaut's boot or by a rover wheel) or by collision (as in a dust storm, wherein airborne dust grains collide with one another in atmospheric suspension). · The means of detection of each (e.g., broadband radio to detect static noise from dust devils, etc.). If opposing theories arise, or alternative detection strategies are developed, they should each be presented with supporting strengths and weaknesses. The students will thus get a taste of comparative planetology and instrument design and selection as practiced by NASA scientists in collaboration with professionals from different walks of life. The following list of URLs was furnished to Carsten Riedel, EU-RTN Volcano Hazard Mitigation, University of Bristol, Bristol, England, upon his request for (1) suggestions about where it will be possible to find the Tarsus volcanoes in the large NASA dataset and (2) satellite pictures from similar earth volcanoes. Suggested URLs for Hawaiian volcanoes, which is what we would suggest you concentrate on. An afterthought: I am more interested in the students thinking through issues that THEY see associated with the Tharsis volcanoes and FORMULATING THEIR OWN SETS OF QUESTIONS AND APPROACHES TO OBTAINING ANSWERS than I am in transferring information to them about why we think thus and so about the Tharsis features. Science--especially this type of science--works in a vast unknown, and the development of good questions is often the activity of paramount importance. Good questions usually contain the seeds of their own answers, or of the means of obtaining those answers. For this activity, I consider answers as being strictly secondary. I consider the process of thinking things through and using available resources (i.e., a good comparative knowledge of Earth) as the single most important activity for the three days that they will be with us. I am most interested in the process and approach that THEY develop to thinking through the fact that these enormous and striking features exist on a sister world that travels in tandem with us around the sun.
. The road followed is fascinating and, apparently, without end. The process of formulating a 'good' question is by no means trivial, as I will try to show in the paragraphs below. A good question is a question grounded in the best knowledge we have in any given area. The open questions of Philosophy are usually not admissible by this criterion. provided, of course, that my ideas hold up under the strict scrutiny of my peers. I've always been fascinated by the idea that the Hellas Basin, the Tharsis volcanoes, and the Mariner's Valley are connected by a single impact event that occurred in Mars' distant past. Does this idea have any real merit? Let's begin by considering the fact that Tharsis and Hellas are not exactly antipodal (i.e., diametrically opposite). This relationship is interesting from the standpoint of earthquake wave propagation. Earthquakes, as you know, produce waves that propagate outward from a highly localized area called an epicenter. Some waves travel along the surface (P and S waves), dissipating their energy in various kinds of surface shakes and shimmies; others travel through earth's deep interior, eventually emerging on the other side of the planet. The various arrivals and re-arrivals of these waves due to reflections, etc., are responsible for the aftershocks we hear about so often in the news. The interior waves are DIFFRACTED by the earth's complex semi-molten core. Diametrically opposite any given epicenter, therefore, there exists a "shadow zone" (quiescent zone) throughout which no interior waves arrive. (On Earth, this zone is actually quite extensive in terms of geographical area covered.) The occurrence and character of the shadow zones provide geologists with important information on the structure of Earth's deep interior. Hellas' and Tharsis' "almost, but not quite, diametrically opposite" relationship becomes very suggestive here. Let us, therefore, ASSUME that a massive impactor struck Mars at the Hellas site (essentially providing an epicenter for an absolutely immense quake event). Let us also ASSUME a molten core on Mars at the time of this event. What might we expect to have ensued? In order for these waves to have been responsible for Tharsis, et al., they would have to have carried enough energy from Hellas to Tharsis through Mars to produce the bulge, the volcanoes, and the Mariner's Valley. First, though, let's return to the idea of a molten core. Although it is pretty well established that today Mars has a solid metallic core, our ideas on planetary formation lead us to believe that, almost certainly, Mars had a molten core at some point in its history. This notion will help us to establish a time frame for our hypothetical Hellas event. Now, because Mars is 1/2 the [linear] size of Earth, we might guess (just for the purposes of roughing out ideas) that it had 1/8 the initial interior heat of Earth and that it cooled at roughly twice the rate. Mars would have grown cold much more quickly than Earth. This idea tallies nicely with conditions observed on Mars today. We observe that the planet is now in a protracted ice age. That Mars was warmer in its past, and possibly more earthlike, is evidenced by numerous arroyos and alluvial features seen from orbit. It is probable that Mars had a more extensive atmosphere in its past than it does now and that much of this atmosphere was lost due to Mars' lower escape velocity (Mars has 1/3 the surface gravity of Earth). This loss, combined with the other factors we have been discussing, would have lead to an overall cooling down of the planet during its early epochs. IF Hellas and Tharsis are connected, then these features MUST be very ancient; in fact, the forming event must have occurred during the earliest initial epochs of Mars' existence. Does THIS idea make sense? Returning to the enclosed calculation: The Hellas impactor is estimated to have been immense by any standard of comparison known today on Earth. Could such an impactor really have existed in the early solar system? And so on. Again, the students might want to pursue these ideas further, or develop new chains of thought of their own. They must remember that speculation must be bracketed as much as possible by our present (though admittedly incomplete) knowledge of reality. We draw on what we know to try to push forward into new realms. And, with r = 1.2 x 106 m, we find that h = 2.0 x 105 m or about 200 km. C. W. Allen, Astrophysical Quantities, 2nd Edition, U. of London, 1963, pg. 139-140. J. R. Percy (ed. ), Observer's Handbook, 1977, Royal Astronomical Society of Canada, pg. 6, 8. I am looking forward to the upcoming week with you and the students. There is SO much to tell them, and SO little time! I hope to convey to them the tentative nature of modern science (all science!) and to convince them of the importance of carefully investigating and developing good questions. I once read a commentary that a well formed question contained within itself the seeds of its own answer. Over my 32 years at NASA, I have come to embrace this idea as foundational in my work. After all, we build our spacecraft, wind tunnels, etc., all based on the logic invested in the questions we wish to answer! Along the same lines: I spoke, a couple of years ago, with a group of exo-biologists who were developing life sciences experiments for Mars. I asked them what sorts of "things" they were looking for on Mars. They answered that they had not the slightest idea. "All we understand is terrestrial biology," one of them explained. "So, we are using terrestrial biology as our starting point. We do not necessarily expect to find terrestrial forms, but we hope to garner enough clues from this initial step to formulate more accurate second generation life-sciences experiments." This experience is one of the most telling cases in point I have ever come across regarding the type of philosophy I hope to share with your students. If they learn some new ways of thinking about their world in the few days that we are together, then they will have achieved more than all the "right answers" in the world put together! 1. Gravitational sliding--why could there be more gravitational sliding on Earth than on Mars? 4. Hawaiian volcanoes get more and more silicic, i.e. explosive, so what they built up is destroyed again. Could that happen on Mars as well? Why or why not? 5. Effect of the moving plate, all is built on one spot, i.e., monogenetic volcanoes on Mars. So that is the plan. The first videoconferencing session is thus more or less an introduction of our group - i.e., Stuart and me - and you at NASA and the students to each other. Your approach makes complete sense. I would add to it the building of scale models. For example, Mt. Olympus is, nominally, 180 km in base diameter and 10 km vertically from base to summit. This set of numbers, taken alone, could be compared with dimensions of the largest mountains on Earth. I enjoy using Mt. Everest, 3.3 km from base to summit. Further: The calderas of Mt. Olympus have scale sizes of around 30-50 km or so. And the vertical escarpments around the base measure something like a 1.5+ km (variable with location). By simply drawing a cross section of the mountain, one gets an immediate impression of flatness (which is surprising at first glance!). A similar exercise could [should] be done with Hellas (2300 km diameter by nominally 200 km depth). Going on, again: The nominal vertical extent of the Martian "lower" atmosphere is 0 - 45 km, and of the "middle" atmosphere, 45 km - 110 km (ref., Kieffer, et. al., "Mars," pg., 810, 811). Thus, the summit of Mt. Olympus is, essentially, in outer space. This fact should strongly influence how the students think about Mars. There is no direct analogy to such a system on Earth. Finally, if a scale drawing of Mt. Olympus were turned upside down and placed into the scale drawing of Hellas (assume a cone-shaped basin here for simplicity), the immense Mt. Olympus would suddenly become a dwarf compared to the even more colossal H. Basin. One might ask how such a "small" planet could acquire such enormous features. Anyway, these are all just suggestions. When we video conference, I hope not so much to lecture as to elicit questions. By doing so, I hope to attempt to address those concerns that are closest to the students hearts and minds without throwing a lot of extra confusing detail. I will rely on you and your colleagues to guide things along on that end and to jump in at any point during my comments as you see fit. Yes, I agree with the enclosed quotation. I am currently reading Jules Verne's "Master of the World," which depicts a period in history when the lone scientist/inventor was a believable and viable entity. With the advent of 20th century science, this lone figure recedes, to be replaced by teams of specialists, each an expert in some part of a field or project whose full content is too large for any one individual to master. The launch of Apollo and the subsequent development of the Space Program bring into existence even larger groups. A successful launch requires the intricate cooperation of several hundred or more people, each with a specific set of tasks that must integrate with precision. The further exploration of our Earth, and the extension of that activity into the solar system (and beyond), will be/become a global undertaking. We now know that the earth is not to be studied as a set of separate systems or subsystems operating semi-independently together. The earth is a single, tightly integrated system, a network, if you please, whose connecting links represent complex information pathways, and whose nodes represent individual states which are, themselves, complex sub-networks connected to the whole. The same must apply to the solar system as a whole, and to its individual planets, moons, etc., as well. International cooperation brings into play resources - people and systems - whose whole is certainly greater than the sum of its parts. Such cooperation is the most viable path into the future, if it can be achieved and maintained peacefully and with a strong bond of mutual trust. I hope you will forgive this long but necessary collective email to you as people who have all so very kindly given of your time in leading the various Project Teams of the Workshop. It really is on track to be an excellent event, and we do thank you. The students will be arriving on Sunday afternoon 22 July and they will be staying at Churchill Hall, as will a number of the organisers. I attach a complete listing of the students and the schools they are coming from to give a sense of breadth of what we are attempting. 1) INTRODUCTORY MATERIALS: Before they arrive in Bristol, it would be immensely helpful for the students to have an introductory sheet about the objectives of their Project Team (in some cases with other material), getting them to think about it in advance. Quite a number of Project Teams have done this quite recently and it is appreciated... we are already in touch with quite a number of the students by email and I know how thrilled they are about the week... and in some cases a little apprehensive. If you are leading a Project Teams whihc has not yet done this, could I say that putting together such a sheet, written in a chatty but informative style, would be immensely helpful; it need only be quite brief. To give an idea what others have done, I have attached (and I hope without causing embarrassment) two examples of such the introductory sheets from the Environment Team Project and the Science through Theatre Team Projects. These have already gone out to the students.When you have a draft, just email it to me and I will deal with the rest. Commons Education Select Committee will also be with us. orientation and introduction to the Workshop, to answer their questions and to link them with their Team leaders. It would be really valuable is you or one of your associates could be with your students at that event. You would also have the chance if you wished to speak to the whole group of the cuff for a few minutes about what your Team will be doing... to give everyone the broad picture. I would value your comments, ideas and suggestions about how to make this session work to maximum effect. 2) MEALS AND THINGS The students will be issued with vouchers for lunches at the Hawthorns, to be taken at any time between 12.30 and 2.00. Students will be staying at the Churchill Hall where they will have their other meals. They will come into Bristol University by bus each morning, and be taken back by bus in the evening; the pick up point is at the Hawthorns. Because there are too many people (students plus adults) for one journey,the bus will do two runs each way each day, (arriving at approx 8.45 and 9.15 each morning and departing at 17.00 and 17.30 each evening). Of course for those Teams where the work is not based on the main University of Bristol Campus, it may not be necessary to come into Bristol at all. 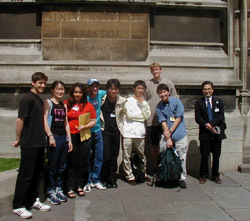 Each team will have the service of a native Japanese speaker who has good English (often Japanese undergraduate or graduate of the University) It is for the Project Team Leader working with these Facilitators to be responsible for ensuring the student groups are given, and follow, clear instructions about where they are to be at all times in the day. 3) STUDENT PRESENTATIONS One of the outcomes will be concise public presentations by each Team of the essence of what they have achieved during the week. This event will be held in the Tyndall Lecture Theatre of Bristol University Physics Department starting at 2.00 on the afternoon of Friday 27 July (we have booked the room all day, so preparations can start earlier). Because there are 10 groups (and all will be very productive) presentations must necessarily be concise and sharp.. 10 min + 5 min discussion at the most I would think. To help the process we are booking a good video projection facility from outside the university, which will enable the Teams to give a taste of what they have achieved efficiently and effectively though video, if they wish; also through Powerpoint. suggestions about ways of making this afternoon a really outstanding and memorable for all concerned. 4) OTHER OUTCOMES Because the presentations will only give a taste of what has been achieved, and because we wish the workshop to maximise its impact, we ask each group to produce a Team Report (in some cases this would include video material) of its work to contribute to the full Workshop Report which we will produce and distribute to interested people as well of course as to the participants. The students could also take copies of their own team reports away with them at the end of the workshop. Finally, we are also setting up a Workshop Website which will provide yet another means of sharing outcomes more widely. Apologies that this has been so long. I hope it is helpful.